Spring is in bloom for April and May flowers. It’s absolutely the perfect time to go visit the vineyards, wine taste under the warm sun, and experience the best of what wineries offer. However, it’s always tough to pick out specific wine country locations. Here is a quick rundown of some of our favorite places and what makes them special. V. Sattui Winery In 1885, Vittorio Sattui opened a small winery in San Francisco’s North Beach, marking the birth of an Italian tradition in Napa Valley. After four generations, V. Sattui celebrates more than 125 years of winemaking excellence. Inside Tip: V. Sattui provides a delightful Italian Deli & Marketplace, featuring more than 200 cheeses, meats, breads, and Italian-style delicacies. Wines: More than 70% of V. Sattui wines are sourced from the winery’s estate vineyards. These acclaimed V. Sattui wines can only be found at the winery, by phone, or through their website. St. Clement Vineyards Even though the estate was built in 1878, St. Clement’s history began in 1976, when William Casey, a local ophthalmologist, bought the house and built a 10,000-case stone winery in the backyard. Inside Tip: Architecture buffs and lovers of great wines who visit St. Clement’s main tasting room appreciate the meticulously restored building. The St. Clement name was a tribute to William Casey’s ancestors, who helped found Maryland. The cross on the St. Clement logo is found on the Maryland state flag. 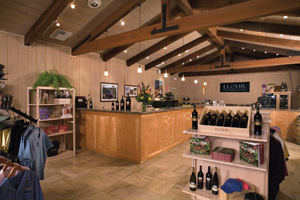 Wines: St. Clement Vineyards has built long-term relationships with some of the best winegrowers in the Napa Valley and continue to build on its legacy of highly respected wines produced in small quantities. HammerSky Vineyards A strikingly beautiful century-old farmhouse distinguishes HammerSky Vineyards. The pictorial property was tastefully enhanced to be a working winery and inn at HammerSky. The restored farmhouse inn boasts casual elegance, and is often described as the Scarlet O’Hara/Great Gatsby House dating back to 1904. Inside Tip: HammerSky Vineyards is pouring some of the most intriguing wines found in Paso Robles. Vineyard owners, Doug and Kim Hauck, have moved away from red Rhône wines in favor of Bordeaux-centric, small lot, handcrafted wines. Wines: The wines range from a 100 percent Sauvignon Blanc, called Naughty Princess, to a pungent Merlot, to the fabulous Party of Four red blend, and a wine club exclusive: an ultra-dark and aromatic Cabernet Sauvignon. The portfolio rounds out with a stunning Zinfandel boasting the big, ripe, rich characteristics common to Paso Robles. Heritage Wine Trail This four-winery itinerary was designed for visitors to the Napa Valley who want to see it all but don’t know where to begin or end. Start in Carneros at Acacia Vineyard, grab your pre-ordered gourmet lunch at Oakville Grocery, drive on to Beaulieu Vineyard, then Provenance Vineyards, and your last stop is at Sterling Vineyards in Calistoga. Inside tip: Each winery (they’re all top-tier) treats you like a VIP with special tours and tastings. No stop is alike. All you have to do is make a reservation in advance. And it’s just $99 per person! Wines: The wines are as varied as the wineries themselves—but they’re all among Napa Valley’s best. Jacuzzi Family Vineyards Valeriano Jacuzzi planted a portion of grapes to his open farm fields during the depression and gained a license to make wine for home consumption in 1936. Today, the winery is a beautiful replica of a rustic Italian stone farmhouse in northern Italian Fruili region, inspired by Valeriano’s grandson owner Fred Cline. 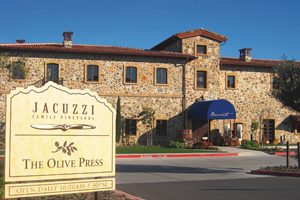 Inside Tip: The Jacuzzi Family Vineyards also produces a wonderful lot of olive oil on-site at The Olive Press. 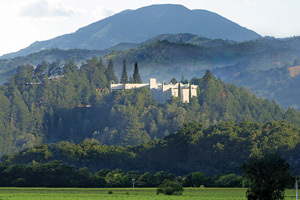 Next door in Sonoma County is Cline Cellars, the Jacuzzi vineyards’ sister. Wines: Jacuzzi Family Vineyards specialize in unusual Italian varietals like Lagrein, Nero d’Avola and Montepulciano, and familiar favorites like Sangiovese, Barbera, Primitivo and more. Cache Creek Vineyards Bill “Poppo” Van Pelt founded the vineyard in 1997 after he was greeted by a majestic herd of Tule elk when he first set foot on the land. As Poppo cultivated the land and planted his vineyards, he made it his mission to maintain a flourishing environment for the elk and other wildlife. Inside Tip: Visitors can gather to listen to the running creek and watch for wildlife animals as they sip a glass of award-winning Cache Creek wines. The tasting room also offers local honey, cheeses, picnic supplies, and more. 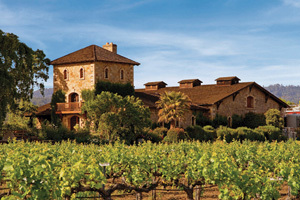 Wines: Currently, Cache Creek Vineyards produces four varietals- Cabernet Sauvignon, Petite Sirah, Syrah, and Chardonnay. The 2009 Reserve Chardonnay recently won a Double Gold Medal at the 6th Annual American Fine Wine Competition. Cache Creek is opening a new tasting room this spring. 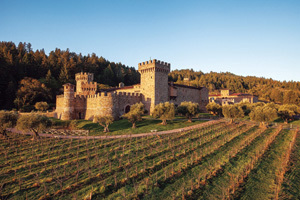 Castello di Amorosa Inspired by Dario Sattui’s Italian heritage, Castello di Amorosa is modeled after an authentic medieval castle. Dario studied architecture for 30 years before he created the 121,000-square-foot fortress, which took 14 years to build, stone by stone. Inside Tip: The Castello has 107 rooms, 95 of which are used for winemaking and wine storage. Reminiscent of Old World castles, the Castello features a drawbridge and moat, a dungeon and torture chamber, secret passageways, courtyards, loggias, a church, horse stables, and a 12,000-square-foot wine barrel room. Wines: Italian style wines with unique touring options for all. J. Lohr Vineyards & Wines Jerry Lohr was among the first pioneers on the Central Coast of California to realize the vast, untapped potential of this now-acclaimed region with the establishment of J. Lohr Vineyards & Wines. Inside Tip: J. Lohr established wine centers in both San Jose and Paso Robles—two great places for lovers of California wine to visit. Wines: J. Lohr offers diverse tiers of award-winning wines, ranging from wines inspired by the classic Bordeux blends to limited-production wines highlighting the terroir of the most esteemed vineyard parcels to a series of Rhône-inspired wines and select varietals. Stags Leap Winery The old stone Manor House was built in 1892 by the Chase Family, who named the estate Stags’ Leap. There are many stories of a speakeasy, bootleggers, gangsters, movie stars, ghosts, and gypsies when the Manor House served as one of the Napa Valley’s most prominent country retreats. Inside Tip: Guests will enjoy an enchanting, intimate 90-minute historical tour and tasting that pairs Stags’ Leap’s legendary history with its handcrafted wines through advanced appointments. Wines: The soils in this “valley within a valley” are diverse, yet mainly fall under two categories: volcanic, and gravely clay loam. Both soil types are coarse and retain little water, yielding intense fruit and rich wines that show remarkable finesse and intensity. 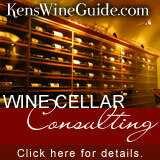 The following article was provided by our contributing partner – Touring and Tasting Magazine. Thank you for singing our praises, Ken & Theresa! Your support is hugely appreciated.